“Oh…right…treasure,” I said slowly as I looked more carefully. And then I could see what he was seeing. This was not random trash dumped by the road. He had assembled each object carefully, the better to appreciate its uniqueness. There was a tri-jointed section of pipe with each right angle turned in a different direction, like part of a jungle-gym. 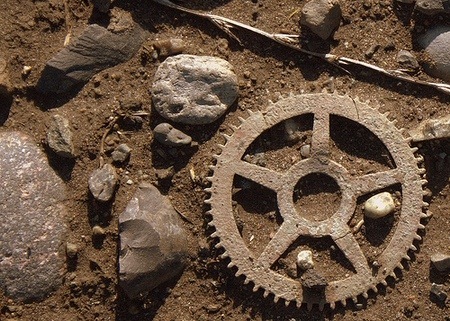 There was a remnant of an old hand pumping mechanism from an ancient well, meshed gears attached to a broken rod that probably came from an old piece of farm equipment, a foot-wide wheel attached to a valve for opening and shutting what? – perhaps an irrigation ditch. Those were treasures, rusty and cracked to be sure from years of abandonment in a field, still caked with dirt, but antique pieces of machinery that couldn’t fail to capture B’s imagination. He must have spent hours digging them out of the ground. I sat down with him to examine everything more closely. He carefully explained the dazzling machine construction he wanted to build with them. It was so clear to me then that I could only see ugliness and danger in everything around me. I was full of impatience, anger, intolerance. I threw those feelings at my family like evil gifts, demanding that they act in certain ways or keep an arbitrary order around the house. That idea of order, of course, could change from day to day. But seeing anything or anyone, especially our three young boys, on the loose, free of that control I wanted to impose, could trigger shouting and raging in outburst after outburst. But then, like Hyde to this Jekyll, I could have days of calm and enjoy the play of my kids and the creative magic that my wife brought to us all. They could never be sure which me they would encounter. At least when B described what he was doing that day, I wasn’t completely lost in a state at once furious and depressed. I could listen in that moment and see what he saw. I was relieved and happy to sit on the ground beside him to learn what he would make of each treasure he had discovered. Here was a way of reconnecting to life and stepping free of depression, however briefly. If I could just think: How else can I see what I’m looking at – here is the disorder but there is the beauty and harmony. It doesn’t have to look ugly, and I don’t have to see myself as a piece of junk to be thrown away. I can remind myself to fight that way thinking by asking a simple question: How would five-year B look at this? What possibilities would he see? Yes, there are several – but an important one is Raging Man in Residence. That’s quite old – here’s the link: http://www.storiedmind.com/2007/12/16/caution-raging-man-in-residence. I’ll go back and get a few others. I’m interested in the relationship between rage and depression. Have you written more about this? Extreme anger – rage – has been part of depression for me but mostly when I’m denying that anything is wrong. Terrence Real goes into that a lot. It’s a force that will burst out if I’m unconscious or don’t want to be aware that I’m in another decline. As soon as that gate against awareness opens and I realize I’m depressed – the outbursts stop. I think of Freud’s shorthand – depression is anger turned inward. Once the anger gets at me, it starts the usual track of self-contempt and self-loathing, etc. That’s why it’s such a blessing when some little thing, like the post incident, can push me into a saner way of seeing what’s around me. Hi John! It’s interesting you brought up anger. My past depression (I say past because that’s where I leave it…hopefully) never combined with depression—it was just sadness and a feeling of rejection and self-rejection. I’ve always had trouble seeing only the good or only the bad in things. I see both, but have a positive spin. If something is bad, I cannot see the good in it—all I see is truth. It gets me in trouble. It’s cost me jobs, friendships, relationships and so forth. At a past job, I exposed the half owner for embezzlement and several cases of sexual harassment against women who worked with me (even though those women did not want me to come forward). He is in prison, I got fired (for being a rat) and subsequently three women suffered public scrutiny for my inability to allow a criminal to ruin lives. All said and done, I was the bad guy in everyone’s eyes; however, I know I did the right thing and I’m over it. Thanks, Dano – That’s been really true for me, when I’ve been able to stop my own thinking long enough to pay attention! The next post has a story about another little boy, but in his case what he taught me was not so happy. Thanks for coming by, as always. That was an incredibly wonderful post of wisdom. The lessons to be learned from a child’s unfettered mind are priceless.